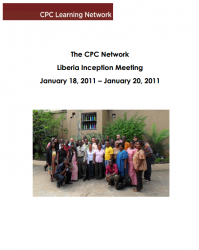 This is a report from the inception meeting of the CPC Learning Network Liberia. In 2011, representatives from a wide variety of Liberian and international non-governmental organizations, UN, government and community based organizations gathered together to attend the Liberian PLG Inception Meeting. The new PLG is dedicated to research and learning that will inform child protection policy and programs in Liberia. It is meant to complement and contribute to other, existing child protection bodies such as the Child Protection Network and work in close collaboration with government institutions.